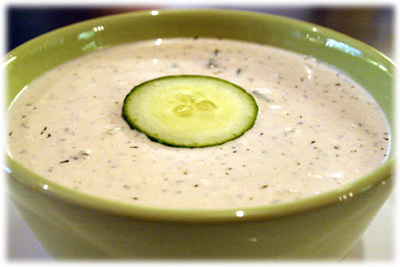 This garlic cucumber sauce makes a nice light summer dip for appetizers and kebabs or even just pita bread. Rich with both garlic and cucumber this yogurt based sauce is very similar to a traditional Greek or Turkish tzatziki recipe. Like tzatziki, this sauce is best served cold and the refreshing cucumber flavor best complements lighter flavored grilled foods like chicken kebabs. I've added mayonnaise to this recipe to thicken it slightly and some Worcestershire for a bit more zip. Real tzatziki requires you to strain the water from the yogurt for 8 - 10 hours but for this recipe it really isn't necessary. If you're not a big fan of yogurt you can substitute sour cream instead. This makes an exceptional dip for the Chicken Kofta Kebab recipe. 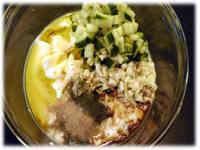 In a small mixing bowl combine all of the cucumber sauce ingredients and mix well. This provides a "chunkier" version like the one in the picture above. If you prefer a smoother sauce then pulse the cucumber and garlic in a blender or food processor until very fine and then transfer to a serving bowl.